UPCC 2000: "Happy 10th Anniversary! And see you again in 2012!" Has it been 10 years? Yes, indeed it has! "...lumilipad ang puso ko sa awit na aking tangay..."
UPCC Batch 2000, singing "Hibang sa Awit"
"...the backstage drama and the last minute glitches..."
It was terribly nostalgic to the point of distress - vocalizations to warm up our throats, stretching to warm up our muscles, the ladies taking forever to put their make-up on, stage managers setting up the lights and the projector for the AVP, the sound checks for the microphones, the position of the piano, marking the stage center, running through choreography blockings, entrance and exit formations, timing the 3-second bow, preparing the bouquet of flowers for the Conductor, and of course, the backstage drama and the last minute glitches. The scene was all too familiar to me, having been a member of this choir for more than 6 years. But everyone handled it expertly. By show time we were all smiles and ready to go. 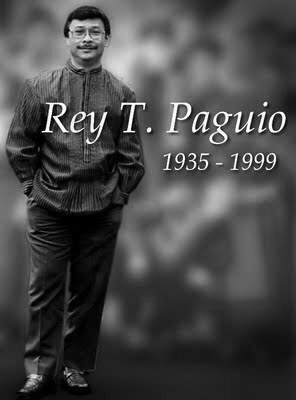 A tribute to our former conductor, the late UP College of Music Dean Rey Tolentino Paguio, UPCC's rendition of the song was featured in the Batch 2000 Millenium Tour CD, and was also the title of the set. It was in October 1999 when "Sir Paguio" passed away. The whole choir was devastated and hundreds of UPCC alumni all the way from the 1960s came to celebrate his life. The current batch was left without a leader, and the future of the then almost 40-year-old choir was in jeopardy. Then Prof. Janet Sabas-Aracama, or Ma'am Jai, UP College of Music Choral Conducting professor and a UPCC Alumna herself, accepted the role of UPCC Conductor and Music Director. All fears were laid to rest after that. 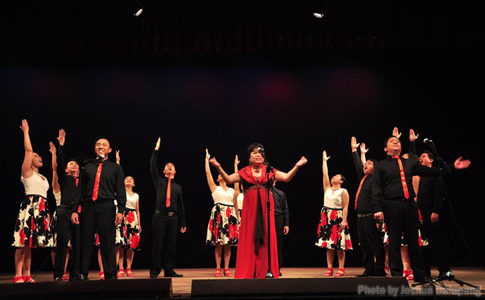 Before Sir Paguio passed, there were ongoing plans of a tour of USA and Europe, the group's 14th International Concert Tour. With only a few months to go, Ma'am Jai and the UPCC Executive Committee and Members, with help from Alumni and friends, managed to keep the ball rolling. In April 2000, the UP Concert Chorus Batch 2000 "Millenium Tour" took flight. The Millenium Tour 2000 featured a varied repertoire from Classical pieces such as Randall Thompson's Alleluia and John Rutter's "O Be Joyful in the Lord", to Filipino Classics such as Agot Espino's "Ambo Hato" and Lucio San Pedro's "Sa Mahal Kong Bayan". The concert also featured revivals from past batches including the hauntingly beautiful "Ili Ili Tulog Anay" and the patriotic "Bayan Ko Medley", and the toe-tapping inducing "Pumapatak Na Naman Ang Ulan". There was also a set for gospels and contemporary songs including Choreographed Broadway numbers for a medley of Gershwin compositions, "As If We Never Said Goodbye" from Sunset Boulevard, and from Les Miserables, "One Day More". We sing the final song of our set. That's me at the mic on the left! 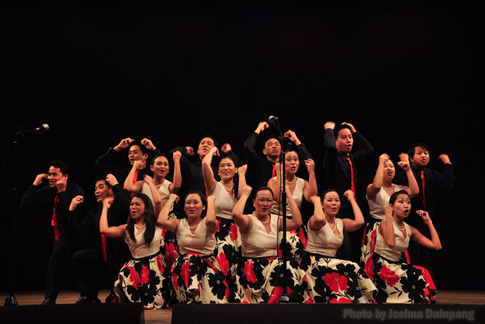 For the 2010 Reason for the Season Concert, we performed 2 of our favorite Choreographed revivals from the Filipiniana set, "Hibang Sa Awit" and "Mambobola", to an excited crowd of friends and strangers eager to see us move. And for our final song, we sang our finale song during the Millennium Tour, a medley of "Amazing Grace" and "How Great Thou Art" featuring our Conductor Ma'am Jai as one of the soloists. This year, our batch celebrates our 10 year Anniversary. 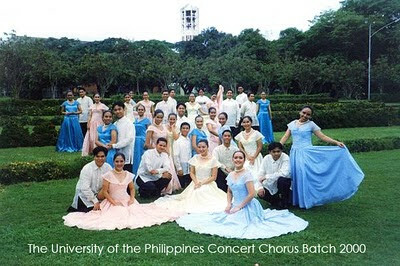 And in 2012, the UP Concert Chorus will be celebrating its 50th Anniversary. I am looking forward to it, and I do hope to see you in one of those concert events! It's going to be epic! Photos from the Reason for the Season 10th Anniversary Concert courtesy of Joshua Dalupang. Thank you Joshua!